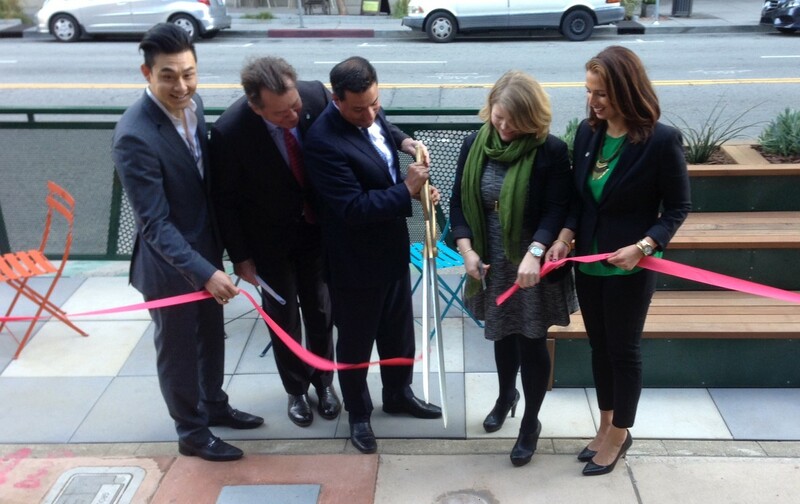 This morning’s Hope Street Parklet ribbon cutting. 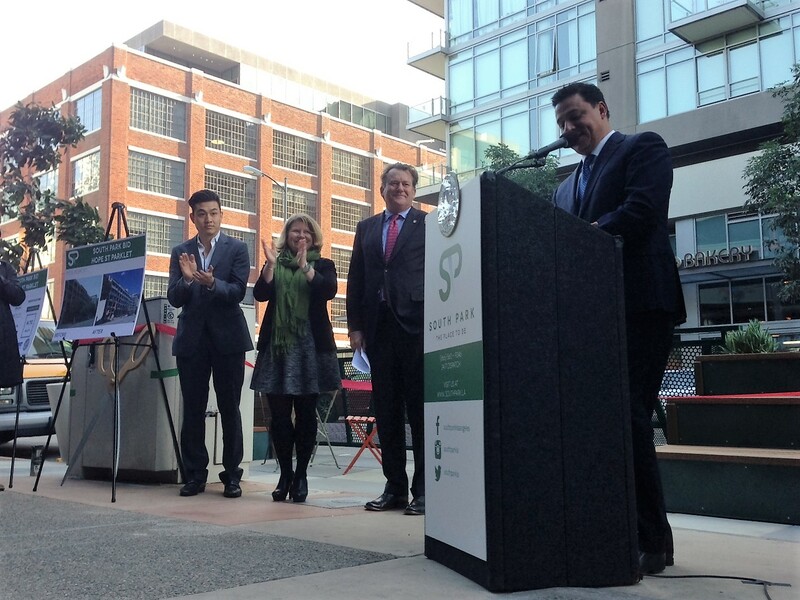 Left to right: Tony Chou of CoCo Fresh, Mack Urban CEO Paul Keller, L.A. City Councilmember Jose Huizar, LADOT General Manager Seleta Reynolds, and Jessica Lall Executive Director of the South Park BID. Photos by Joe Linton/Streetsblog L.A.
People Street meets Hope Street. 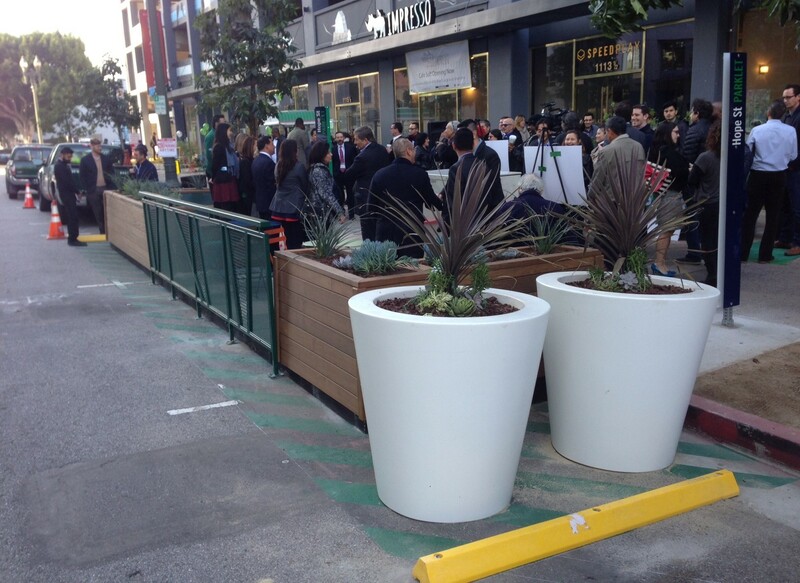 Just over a hundred people attended the grand opening of Los Angeles’ newest parklet, located on Hope Street just below 11th Street in the downtown L.A. neighborhood of South Park. In case you are not familiar with the term, a parklet is a mini-park that replaces a parking space or two. Though it is an informal practice all around the world, the concept got its start in San Francisco. 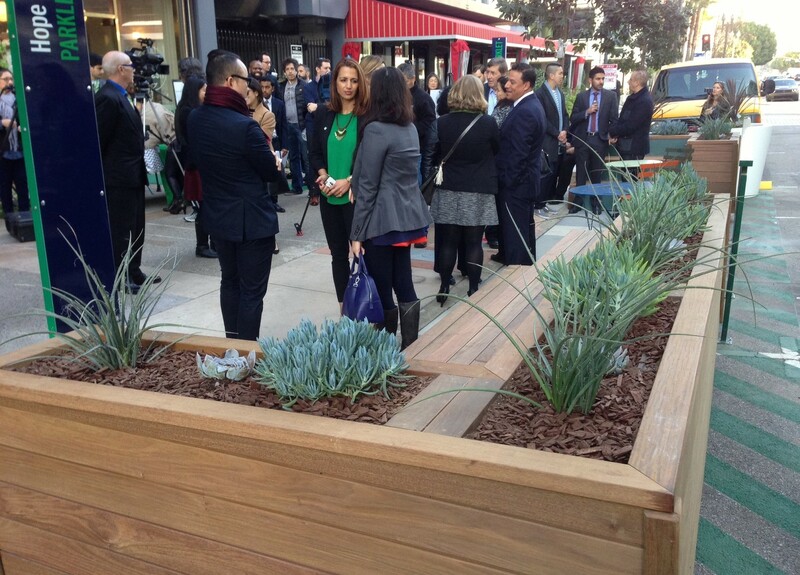 L.A. County’s first parklet was in Long Beach. Now they have spread to Huntington Park, East L.A., Northeast L.A., and other parts of downtown. The latest parklet is actually the first to come to completion under the official LADOT People St program where communities can request parklets, plazas, and bike corrals. 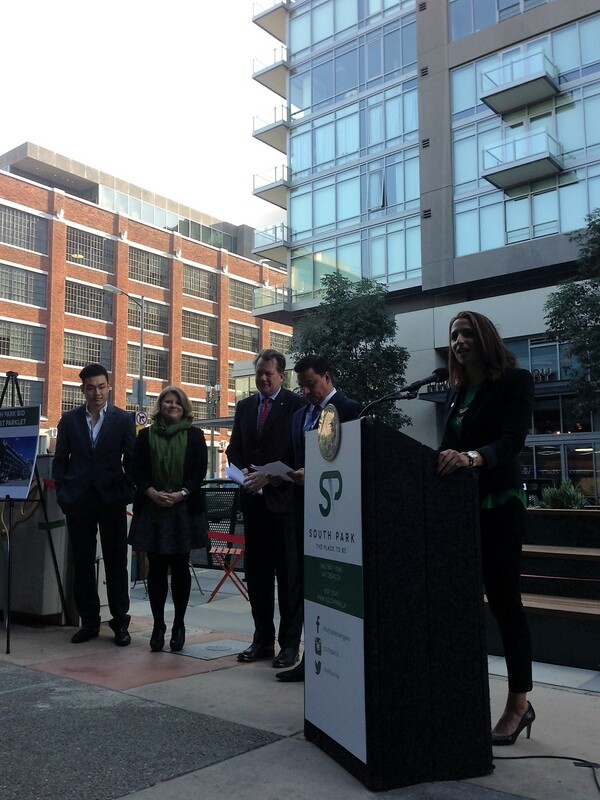 People St projects require a community partner; this one was shepherded by South Park Business Improvement District. South Park is changing dramatically, with a great deal of new high-rise residential development open, and more on the way. The parklet’s Hope Street block has undergone a dramatic transformation in the past couple years. What had been just an anonymous parking structure added ground floor retail. The BID repaired the sidewalks and replaced the street trees. 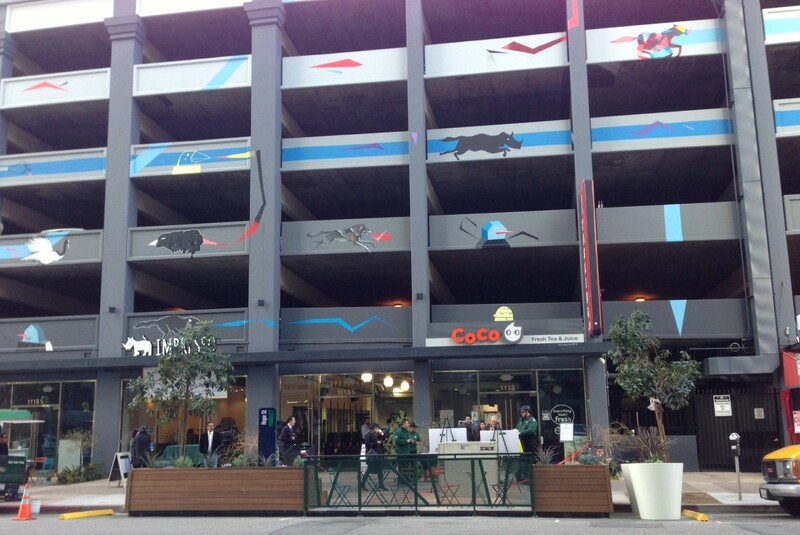 Now the parklet extends the already walkable, inviting atmosphere. Enjoy the photo essay of today’s opening celebration – after the jump. The Hope Street Parklet sits in front of a multi-story parking garage that recently converted its street frontage to walkable retail. The parklet takes up two parking spaces. The north end is protected from traffic by two large circular planters. 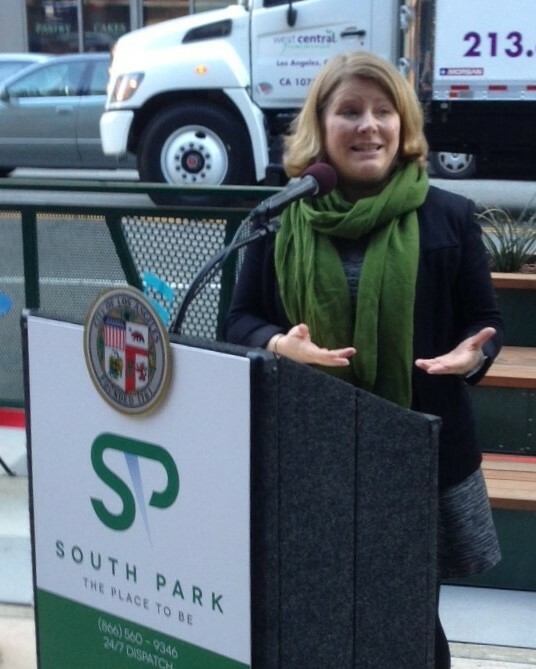 Councilmember Jose Huizar praised the relative ease of installing parklets today, compared to difficulties with the city’s first parklets in Northeast L.A.
LADOT GM Seleta Reynolds touted the 30,000 square-feet of new public space created under the LADOT’s People St programs. The south end of the parklet features additional plants and stepped seating. 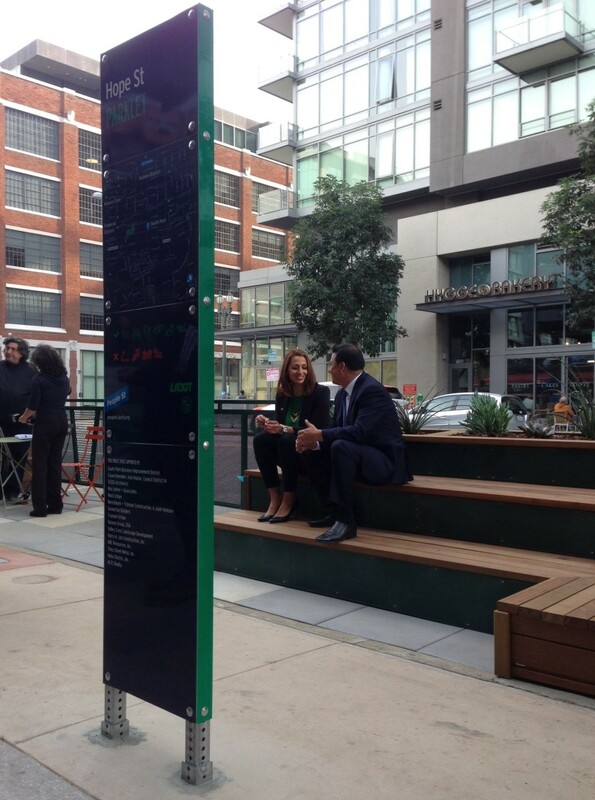 A former parking space now hosts Councilmember Jose Huizar speaking with South Park BID Executive Director Jessica Lall. Wow, this is ridiculously stupid. Any idea that helps reclaim some of the space wasted by cars is a good idea. Yes, just what we need when we have so little parking as it is. Now I can appreciate all the lovely parklets as I destroy the environment circling the block for hours with no place to park. My guess is the geniuses who came up with this idea have nice wide driveways or garage parking that their employers pay for.